It was big-band swinging and hip-hop belly-dancing Bach, the very J.S. like you’ve never heard. In a program titled Bach Re-Invented, the New York-based Absolute Ensemble made its Canadian debut at Toronto’s Koerner Hall Thursday night. Led by conductor Kristjan Järvi, the 18-piece electro-acoustic ensemble gave Bach’s keyboard inventions a contemporary makeover that is anything and everything goes. Jazz, funk, classical, rock, hip-hop, Latin, Middle Eastern, and whatever else you can identify, it was all there, with funky stage lighting to boot. Son of conductor Neeme Järvi and brother to Paavo Järvi, Kristjan, who was married to Canadian violinist Leila Josefowicz, co-founded Absolute with composer Charles Coleman in 1993. The group, comprised entirely of multitalented virtuosic players, has established itself as one of the most fascinating new music groups to watch. Aside from Coleman’s Innovation J.S., loosely based on Bach’s Two-Part Inventions No. 5and No. 8, all of the works in this program were composed by current ensemble members. Guitarist/rapper Gene Pritsker’s piano concerto Reinventions, featuring pianist Simone Dinnerstein, was a standout. Despite being a bit fragmented as a whole, the contrapuntal composition was Bach-laden and Pritsker’s turntable scratching on a Mac Book and hip-hop dancing were something Bach the inventor would have found interesting. 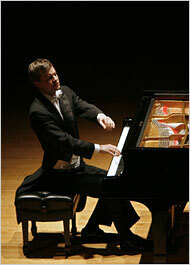 Pianist Matt Herskowitz’s piano concerto Undertow featured the composer himself on piano. Based on Bach’s Three-Part Invention No. 9 in F Minor, the piece built up a wave of energy that is both lyrical and neurotic. Cellist Mike Block’s beautiful Raga on a Theme by Bach was a relatively laid-back excursion in comparison. It was followed by saxophonist Daniel Schnyder’s wailing and choppy concerto grosso, toopART Reinventions, which saw Dinnerstein return to the piano bench. Overall, there were some dazzling and robust solo playing, especially from clarinetist Michiyo Suzuki, violinist Adam Taubic, trumpeter Wayne du Maine, trombonist Mike Seltzer, bassist Mat Fieldes, and drummer/percussionist Damien Bassman. Dinnerstein, also making her Canadian debut, has been an unstoppable rising star ever since her debut recital at Carnegie Hall and recording of the Goldberg Variations. She displayed flawless techniques throughout and produced an unusually crisp sound from the keyboard. Her phrasings were concise, imaginative, and boundless. Mervon Mehta, executive director of the Royal Conservatory of Music, announced before the concert that he is in talks with Dinnerstein to have her back for a Goldberg recital. That day can’t come soon enough. Danse : Séverine Lombardo et Anne Thériaultsont à Tangente du 18 au 21. Pour les amateurs de classique, le Ballet de Guangzou danse La Sylphide du 18 au 20 à la salle Wilfrid-Pelletier. The big news for Toronto opera fans this week is the arrival of Georgian mezzo Anita Rachvelishvili to sing the last four performances of Carmen at the Canadian Opera Company (Feb. 17, 20, 23, 27). Only 25 years old, Rachvelishvili was plucked out of the La Scala young artists program by conductor Daniel Barenboim to sing the title role of Carmen that opened the La Scala season last December 7. Despite the incredible pressure, Rachvelishvili received favourable notices and a well deserved ovation from a highly critical opening night audience. 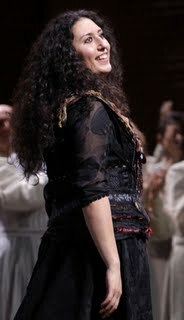 While the loggionisti heckled stage director Emma Dante, they only had cheers for Rachvelishvili. In addition to this important cast change, American tenor Garrett Sorenson takes over the last two performances as Don Jose (Feb. 23, 27) The COC run of Otello continues, with performances on Tuesday Feb. 16 7:30 pm and Friday Feb. 19 7:30 pm. Another piece of big news this week is the Verdi Requiem at Roy Thomson Hall, starring Michele Crider, Daniela Barcellona, Maxim Aksenov and Roberto Scandiuzzi as the quartet of soloists, together with the Toronto Mendelssohn Choir under the direction of conductor Gianandrea Noseda. This is part of the Toronto Symphony Orchestra season, with a big name international cast. Michele Crider's big dramatic soprano is ideal in "Libera me" - the last time I heard her several years ago, her high pianissimo B flat was exquisite. Any performance of the magnificent Verdi Requiem is an occasion, but with a stellar cast like this, the event is not to be missed - Feb. 18 and 20, 8 pm at Roy Thomson Hall. Tafelmusik offers Mostly Mozart with conductor Bruno Weil at their usual venue of Trinity-St. Paul's Centre on Wednesday Feb. 17, 7 pm. On the program are Serenade K 525 "Eine Kleine Nachtmusik", Piano concerto. No. 20 K466, and Haydn Symphony No. 97. The program is repeated on Feb. 18, 19, 20, and 21.